ASX 200 closes down 45 to 5672 as selling accelerates. High 5703 Low 5656. Average volumes. Miners and energy stocks sell off. Banks cling to small gains. Insurance slips. Telcos mixed as TLS fades. YAL +8.50% HK pricing range. CSL -1.44% rival potential move into China. DXS +2.49% new logistics trust. APT +5.76% APX +3.59% WTC +2.38% tech recovery. MIN -6.65% profit taking continues. SGM -3.79% metal prices weigh. QAN +2.79% oil price weakness. IGO -7.71% exploration program fails to excite. FMG -3.99% iron ore pricing. KGN +9.22% Citi deal helps. Speculative stock of the day: Biotron (BIT) +2.63% the Company’s AGM presentation has been greeted by strong buying following its successful BIT 225 HIV Phase 2 data. Rally faded at the close. Biggest risers – YAL, APT, VEA, SUL, MOE, IPH and AX1. Fisher & Paykel Healthcare (FPH) +1.79% HY19 Results broadly in line with expectations. Net profit after tax rose 20% YoY to NZ$97.4m, while operating revenue lifted 12% to NZ$511.3 with 58% of that contributed by products in the Hospital group. An interim dividend of 9.75 NZ cents per share has been announced, an 11% increase on last years. The company expects FY19 net profit to be in the range of NZ$205m to NZ$210m, with operating revenue of approximately NZ$1.07bn. SKY Network Television (SKT) +3.14% Have appointed Martin Stewart as Chief Executive Officer starting 21 February 2019. Stewart’s resume includes time as CEO of the Middle East’s leading pay-TV station ‘OSN’, CFO of Sky in the UK, CFO of the Football Association and 7-years service on the Board of London Organizing Committee for Olympic and Paralympic Games. Kogan (KGN) +9.22% Have signed an agreement with Citi to launch Kogan Money Credit Card. The card is expected to be available to consumers in 2019. Galaxy Resources (GXY) –1.53% Have completed the sale of the northern tenement package at the Salar del Hombre Muerto for a total of US$280m. The funds raised from the transaction are set to be used to immediately further the development of the Sal de Vida Project. Dexus (DXS) +2.49% Has established a JV with GIC to establish a $2bn wholesale unlisted logistics trust. JV will be seeded with assets from Dexus’s existing industrial portfolio comprising A$1.4bn of core logistics properties and a A$138M development landbank. GIC will be the foundation investor taking an initial 25% investment in the core portfolio, with the capacity to acquire an additional 24% by June 2020. Proceeds from the sale will initially be used to reduce debt and provide capacity for future funding commitments. Newcrest Mining (NCM) +0.47% Speculation that NCM and Goldcorp could be considering a merger. It has been reported that NCM has been meeting with US gold producers in considering industry consolidation. Goldcorp presents as a good-fit, given geographical diversification with mines in Canada and Central and South America. The four horsemen of the apocalypse driving house prices according to Chris (Clarke) Kent from the RBA. Increase in supply in Brisbane, Sydney and Melbourne. Weaker demand from foreign buyers. Substantial run up in housing. NAB CEO Andrew Thorburn in the Royal Commission hot seat today. Long day. Moody’s Investor Service has forecast overdue and delinquent loans will rise as mortgages convert to principal and interest from solely interest only. Genius. One born every minute. The top ten retail IPOs that investors have rushed with extraordinary oversubscriptions, are down 36% on average. Coal and iron ore under pressure in Asia. 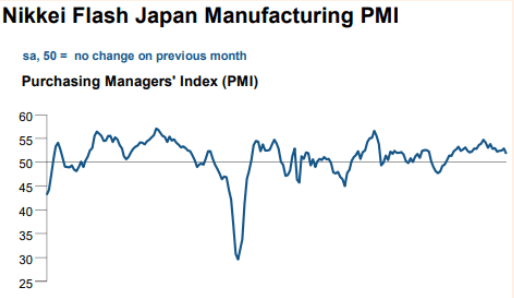 Japanese flash manufacturing PMI at a 2-year low. Over to PM May now to sell the Brexit deal to Parliament and the people. Bit like George W saying Mission Accomplished. Trouble between Russia and the Ukraine will make G20 a little more interesting. Swiss voters reject ‘self-determination initiative. Have we seen peak iPhone? 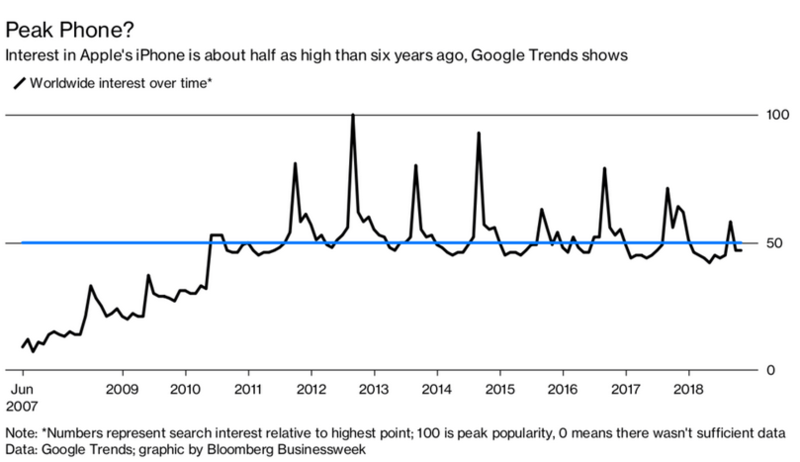 Maybe according to Google trends. “Oh, no, I’ll be alright. I’ll be fine in a few minutes,” the man replied. He was in obvious agony, lying in the fetal position, still clasping his hands there at his groin. At her persistence, however, he finally allowed her to help. She gently took his hands away and laid them to the side, loosened his pants and put her hands inside.